For years, asbestos companies knowingly allowed countless employees to work closely with asbestos products and face health risks from exposure. Thousands of people are diagnosed with mesothelioma and other asbestos-related diseases every year as a result of such negligence. Mesothelioma victims and others facing asbestos-caused illnesses have legal options to hold these companies accountable and receive the financial compensation they deserve. This money can help cover expensive medical bills and other treatment-related costs like travel and lodging, recover lost wages, and secure your financial wellbeing for the future. The first step to receive compensation is filing a mesothelioma claim against a particular company or trust fund determined as responsible for your asbestos exposure. There are several types of claims you and your loved ones may be eligible for based on your individual circumstances. Claims can be paid by different sources, like insurance companies or the Department of Veterans Affairs. Work with an experienced lawyer to help you through the process. Typically filed against a particular asbestos company or trust fund. Legal claims often result in a settlement or verdict. A statute of limitations is a deadline set by each state for how long you have to file a mesothelioma claim. The statutes may vary based on the type of claim being filed, personal injury or wrongful death. Most states have deadlines of 2 or 3 years to file a claim. The venue for filing can be based on residence, job or military service location or the location of the responsible asbestos company. There are several avenues in which a mesothelioma victim or surviving family member can file a claim and potentially receive financial compensation. Depending on the type filed, the money to pay these claims can come from a few different sources. A mesothelioma settlement of verdict generally comes out of the litigation process after a claim has been filed against a particular asbestos company or bankruptcy trust funds. The amount of compensation received will vary based on your individual case. Asbestos trust funds were created in the bankruptcy proceedings of some asbestos companies to ensure victims could still receive compensation. These types of claims have an established process to determine eligibility and disperse funds based on a set payment percentage. Mesothelioma is recognized as a covered disease by the Department of Veterans Affairs, so veterans may be eligible to file a benefits claim. This type of compensation is usually paid in a set monthly amount depending on the individual claim. Workers exposed on the job who later develop mesothelioma or another asbestos-related disease may be eligible for this type of benefit. Compensation amounts will vary based on each state’s maximum award limits. 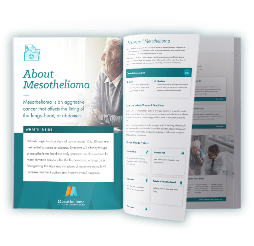 To help ensure your mesothelioma claim is successful, it’s important to take the time to find an experienced mesothelioma law firm that has the knowledge, resources and proven results to handle your claim through the entire process. Page last modified on August 6, 2018.